Panther Pantry Needs You to Shop! The weather is becoming more spring like, so you have no excuse to start making plans for your garden and flower beds this weekend. 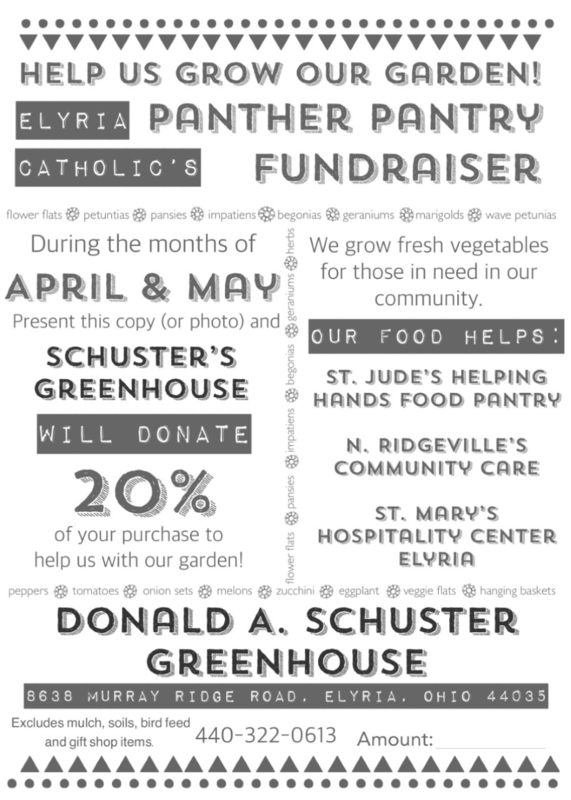 By shopping at Schuster&apos;s Greenhouse, 8638 Murray Ridge Road, Elyria during the months of April and May you will help EC&apos;s newest club, the Panther Pantry, as they gear up to prepare for planting season. Their mission is to provide food to those in need in our community. When you present the coupon available in the link below or show the digital image, Schuster&apos;s will donate 20% of your purchase to the Panther Pantry. Help support our students who are making a difference in our community. Click HERE for the full coupon. A big shoutout to our Athletic Secretary, Mrs. Linda Schuster &apos;77 and her family for so graciously offering this opportunity to our Panther Pantry. Thank you!!! Loyalty That Never Dies!